We decided two days before Super Bowl XLVII to visit my parent’s annual Super Bowl party. Since my family are huge 49er fans, this was a big year. 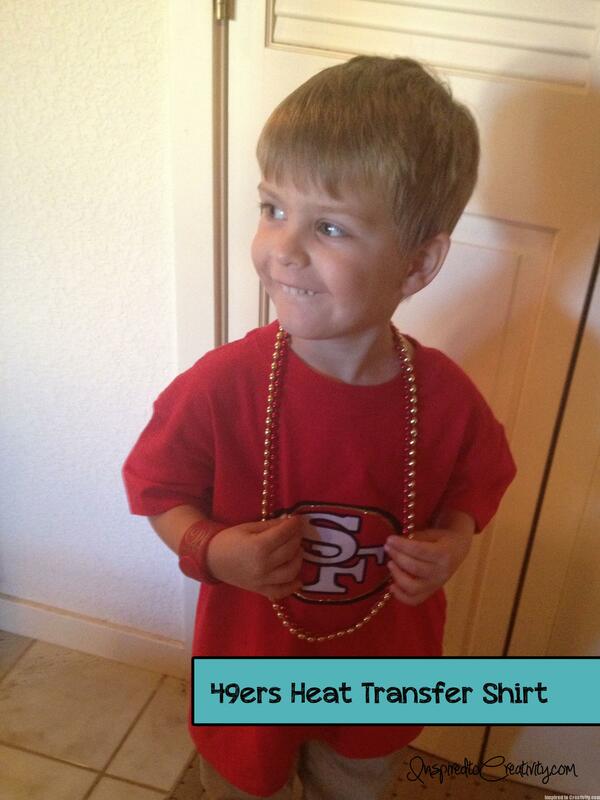 I tried to find a 49er shirt that was my son’s size near us, but there wasn’t anything. Since I had a bunch of heat transfer vinyl, I decided to trace the logo using the Silhouette software with the different pieces for the colors. Then each piece was cut out of heat transfer vinyl and ironed onto a red T-shirt. The heat transfer vinyl used was black flocked, white flocked, and gold glitter. Everyone was really surprised that it wasn’t something that was purchased in a store, which made me really happy since I only spent around 20 minutes on it. We had a great time at the party even though they didn’t win!